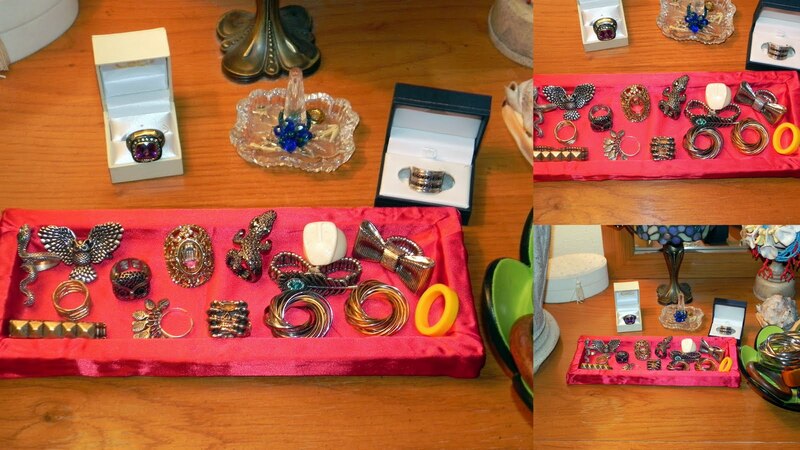 Today's DIY is a quick and easy pretty organization fix. I need to do alot more of these! Behold part of my huge dresser. 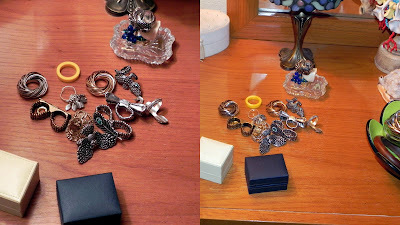 This is where I throw all my rings when I take them off. 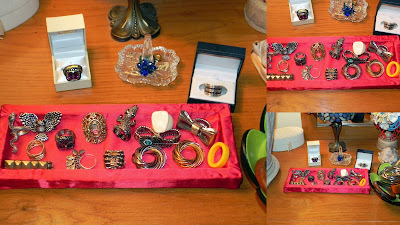 (Yes, I have a jewelry armoire, but I only keep the good stuff in there) So it's pretty much a disheveled mess of rings. I've had this little wooden tray from a zen garden that my kids spilled all the sand out of; I'm so glad I kept it to repurpose! Pick an edge on the bottom to begin gluing down the fabric. Run the glue down the entire edge, and securely press the fabric onto it. Glue the edge above and press the fabric. Keep doing this until the entire surface of the tray is covered. After about 5 minutes of gluing and pressing and folding, here it is! Now my rings all have a home, and it looks pretty on my dresser next to my flower bracelet bowl! I'll be doing a lot more organization (that are also decor!) DIYs coming up, so I hope you like this! Let me know what you'd like to see more of in the next 17 days of DIY, and I will try to get them in! Labels: 30 Days of DIY, DIY, Jewelry, organization, Rings. Thanks!! Yes, you totally could, and there is no excuse for not having a glue gun, missy! LOL! Love your jewelry! And the holder box turned out really cute! This is great. I need one immediately! !